Lock Poker took almost everyone by surprise when the room abruptly exited the Merge Network in June of 2012. What had been one of the leading rooms for the Merge Network became one of Merge's largest competitors virtually overnight. 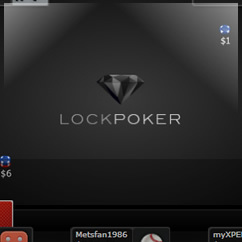 Lock's exit from Merge, and the subsequent announcement that Lock was taking over the Cake Network and rebranding it as the Revolution Gaming Network (with Lock as the flagship room), generated a ton of player interest in and media coverage of Lock Poker. If you're looking to cut through the hype and learn more about Lock from an objective perspective provided by someone who plays at the room, then read on for our review of Lock Poker. 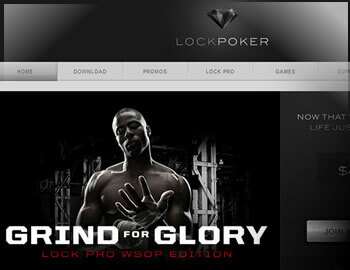 The software for Lock Poker supports the standard suite of online poker games - Holdem, Omaha and Stud. As part of the Revolution Network, Lock Poker is one of the 10 largest poker rooms online (when measured by real-money poker traffic), ensuring a fairly wide selection of games during most of the day for both cash game and tournament players. No Limit Texas Holdem accounts for about 90% of the cash game activity at Lock. Pot Limit Omaha takes up the majority of the remaining action at Lock Poker, with Omaha Hi/Lo accounting for a few tables at most hours and the 7 Card Stud variants offered by Lock (Hi and Hi/Lo) usually running only at or around peak times. The room does not offer any mixed games, 5 Card Draw or other variants for cash play besides those listed above. The majority of cash play takes place at micro-to-low limits, with some action at mid-stakes and the occasional high stakes game. The tournament lobby at Lock Poker is arguably the most active of US-facing poker rooms, with a reasonable selection for Sit and Go tournaments (SNGs) and Multi Table tournaments (MTTs). Again, No Limit Holdem is far and away the most common game type offered, but you will see a smattering of other formats, especially during times of higher traffic density like weekends or specific MTT events. Players should expect to find far more buy ins under $20 than above for both MTT and SNG play. What players won't find at Lock is a fast-fold client similar to Sprint Poker at bet365 or Zoom Poker at Stars. We are not aware of any plans by the room to develop and offer such a client anytime in the foreseeable future. The core difficulty that Lock faces when it comes to providing players with a regular feed of weak opponents is that Lock is marketed very aggressively toward experienced online poker players. While the room certainly engages in mainstream marketing efforts as well, the typical player at Lock is simply more likely than average to be a player with a reasonable amount of online poker experience. That certainly doesn't mean there aren't soft spots in the games, especially as you start to move to the lower end of the stake spectrum. It simply means that when it comes to grading the softness of games at Lock, we'd have to settle on an average to below-average grade for the room. The downloadable client for Lock Poker is available for both Mac and Windows operating systems - a bonus feature that not all US-facing rooms can claim. Where Lock slips a bit is the area of mobile compatibility; with no version of their poker room available for Android or Apple mobile devices, the company essentially shuts out the small (but growing) segment of mobile real-money poker players. Lock also does not offer an instant-play version, so those looking to play with no download or on an operating system such as Linux will need to make alternative plans to join the online poker games at Lock. Banking options at Lock Poker are highly customized to the individual player. After you sign up with Lock, you can consult with a customer support specialist who will help you determine the best possible deposit option for your particular situation. The primary cash out options at Lock Poker are check and a handful of transfer methods. While waiting times for these methods are always in flux, our survey of withdrawal reports and player feedback strongly suggests that Lock is at or above average when it comes to time frames for withdrawals. Lock Poker is licensed and regulated by the Government of Curacao. As online poker rooms operate simultaneously in multiple jurisdictions, there's always the chance that in some of those jurisdictions the legality of online poker is a unsettled matter. The good news for players is that very few jurisdictions have laws on the books that make it a crime to simply play online poker, and therefore the risk of encountering legal trouble for playing at a room like Lock Poker are essentially miniscule for the majority of online poker players.